This summer, Chicago’s Americana singer-songwriter Thomas Pace is set to release Shaking Faith, his fifth solo Cd and first since the release of the critically acclaimed New American Way in 2008. Pace marks the end of a two-year hiatus from music with a finely crafted, nine-song collection of moody and moving alt-country tunes that are littered with subtext and list hopelessly toward heartbreak. During the two years of self-imposed exile from the music industry, Pace devoted himself to child rearing and to screenwriting and filmmaking. “It was impossible for me to effectively dedicate myself to music while raising my boys (Tristan 6 and Jody 4), so I turned to screenwriting.” Pace’s script “Lucky Star” won Best Feature at the Vail Film Festival and Best Drama in The Hollywood Screenwriting Contest. “After that, doors just started to open for me.” Pace’s short film, “Mr. Goodman,” had it’s premier on May 13th at the Gene Siskel Film Center. 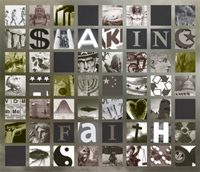 Shaking Faith is a record with heart and depth. It’s solemn meditation on heartbreak from a well-seasoned storyteller.